Under a massive blanket fort, “Brave Space” explores being an ally in an culture that worships individualism and self-reliance. 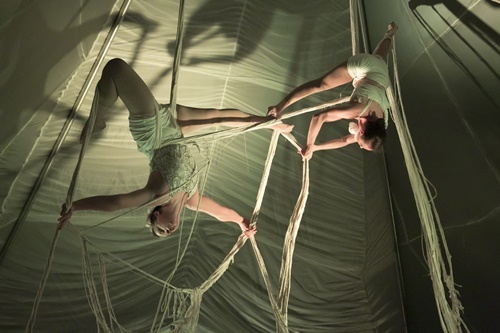 Aloft Circus Arts, a contemporary circus company from Chicago, is touring its new show “Brave Space” around the Midwest, coming to Kansas City, KS on March 30 for one night only. Inspired by the idea of creating trusting communities in trying and dangerous times, Brave Space starts as a puddle 250 yards of fabric on the floor, and, with the help of the audience, grows into a massive blanket fort–a world of hope that includes interdependent acts of aerial arts, acrobatics, juggling and balancing on 8 ft high poles. A show that is impossible to perform without an audience, each act in Brave Space is designed to physically draw spectators into the experience of putting oneself on the line for the safety and well being of at-risk members of a community. Not passive viewers, the audience becomes a part of the show, sometimes helping to raise the tent, sometimes holding ropes that keep trapeze artists aloft, sometimes standing so close to the performers you can hear their hearts beating. Brave Space was created as an antidote to the horrors of daily news cycle. It’s not a “safe space,” but, an immersive performance that requires the audience and artists to show up as their best selves, encouraging them to care of themselves and those around them. “I wanted to create a show that felt like the opposite of the Handmaid’s Tale–something empowering. I wanted to create the world I want to live in, even if it only exists for an hour at a time,” director Shayna Swanson explains. To ensure intimacy and safety, the audience is limited to 100 people per show, and audience members must be able to sit on the floor, stand up, walk around for the duration of the performance. Audience members requesting assistance, or a chair to sit in, should note so when purchasing tickets. In addition, Brave Space may make persons suffering from claustrophobia feel uncomfortable at times. Founded in 2005, Aloft Circus Arts brings heart and artistry to a performance art usually associated with physical strength and fearlessness. The resulting shows highlight more than just the physical capacity to fly, twist, balance, and spin – we celebrate the human capacity for sensitivity as well as strength, beauty as well as bravery, empathy as well as pure creative fire. Our performers are some of the premier athletes in the world, from a diverse range of circus acts – but when we work together, the stories we share with the audience are always about the feelings and experiences that unite us all. We look to have a direct emotional dialogue with our audience, and due to our accessible nature, everyone regardless of education, age, culture or background can be engaged. Aloft has produced 8 full length shows and performed countless one-off performances around the world. Our ongoing shows “El Circo Cheapo Cabaret” and “Sanctuary” have gained a cult following in Chicago, selling out every monthly show for the last 11 years! In addition to performances, Aloft runs one of the largest circus schools in the United States, creating a training center for new artists so that we always have exciting new talent to bring our productions to life. Shayna Swanson is an award-winning circus artist, director and founder of Aloft Circus Arts. Her artistic work pushes the limits of physicality and emotion, described by the Chicago Reader as “truly heartfelt and creative”. As a former competitive gymnast and diver, her work naturally fuses difficulty, strength and intricacy with thoughtfulness and surprise. Shayna developed her circus voice in the land before social media, in the “Circus Wild West”, a world of shoddy trapezes hung from trees and sneaking into warehouses for shows. While she’s learned better safety practices, the punk rock ethos still nips at her heels. After slogging through a sociology degree, and 7 months in Circus School she was ready to transform her raw energy into art. In 2005 she received the Glenn P Davis Scholarship, for excellence in aerial choreography, to the Aerial Dance Festival in Boulder. That same year she formed Aloft and, with a grant from the City of Chicago, produced the her first full-length show “Rolling Blackouts”. In 2006 her choreography was selected into the repertory of Thodos Dance Chicago and featured in the Best of Dance Chicago Showcase. Also that year the Chicago Reader named her a “Mover and Shaker” of the Chicago dance scene. She has been acclaimed at national and international aerial and circus festivals. Her unique rope act won the “Best Performance of Festival” Award at the 2011 American Aerial Acrobatic Festival, a Special Prize at the 2011 Circuba Festival in Havana, Cuba and was featured at the Huishan Acrobatic Festival in Taiwan and Collision Arts Asia Festival in Malaysia. She is also the 2012 US National women’s Cyr Wheel Champion.